Accent Chairs There are 130 products. This accent chair brings effortless style to your home. 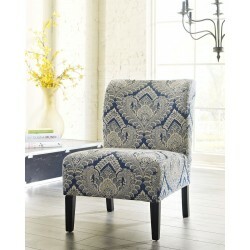 Herringbone weave upholstery in dreamy blue covers the supportive cushions. Kidney pillow adds another element of comfort. Armless silhouette is the right fit for trending small spaces. Have a pet or small children? No worries. High-performing Nuvella ® fabric is easy to clean. This accent chair brings effortless style to your home. 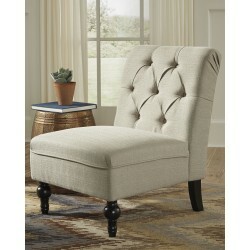 Herringbone weave upholstery in warm gray covers the supportive cushions. Kidney pillow adds another element of comfort. Armless silhouette is the right fit for trending small spaces. Have a pet or small children? No worries. High-performing Nuvella ® fabric is easy to clean. 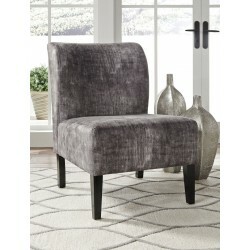 This accent chair brings effortless style to your home. Cheetah print in ivory and charcoal gray covers the supportive cushions. Kidney pillow adds another element of comfort. Armless silhouette is the right fit for trending small spaces. Have a pet or small children? No worries. High-performing Nuvella ® fabric is easy to clean. 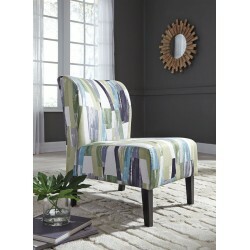 An accent chair that puts the accent on fresh fabric and clean-lined form. Chic and streamlined, it's just enough furniture to complete your space. Curved back cushion and lumbar pillow blend style and comfort.